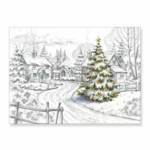 We have a wide selection of different CCA Christmas cards here at C L Promotions, all available printed with a signature of your business details and company logo. All you have to do is pick out your favourite card from the 100s we have to offer, and we'll take care of the rest. So why not advertise your business details on our CCA Christmas cards today! Let your customers know they're valued, encouraging customer loyalty and repeat business. Other promotional and personalised items besides our CCA Christmas cards click here. To find out more about our CCA Christmas cards click here and fill in the contact form and we'll get straight back to you with a FREE quote.